The guy that first came up with the idea for this mod, named Andree, has a website, pixla.ch. Maybe he first wrote about the mod on his blog or something (I can’t find it if he did) thus the name “Pixla’s Mod” which turned into “Pixlas Mod” because people are too lazy to type an ‘ I guess. I’m sure there are other options for tools and taps, these are simply the ones I decided to go with. I’ve read that the Posi-Tap is a popular choice for this mod as well. The screw bits, flexible extension an screwdriver I used are all in this iFixit toolkit. Let’s dive right in! I have tried this mod with the Mac standing up and with the Mac laying flat on a table. Having the Mac laying down makes things much much easier. I made this a step-by-step that covers everything, even stuff you probably already know. This way it can be useful to everyone. All images can be enlarged by clicking on them. I recommend reading this whole guide first before starting, don’t just follow along before you know the whole process. Put the Mac Pro down on a towel or something soft that won’t scratch your Mac. 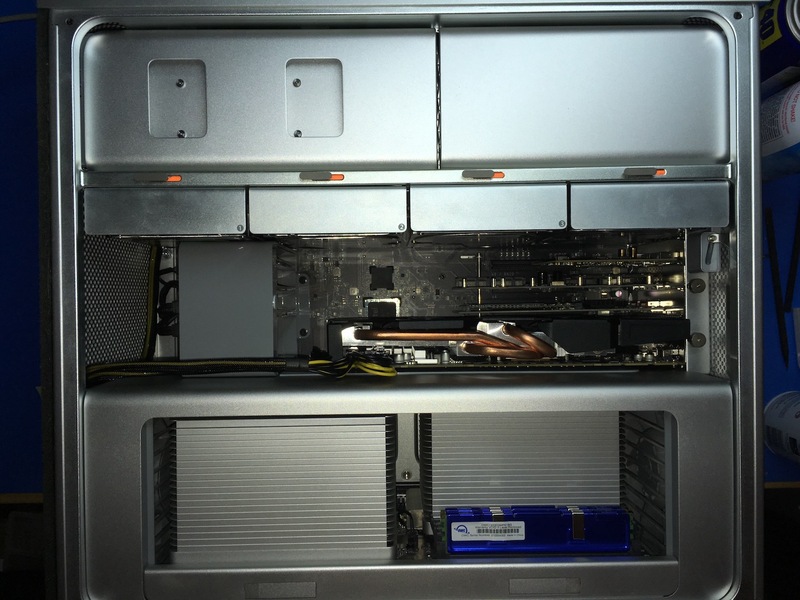 Start by removing the PCI cards, all hard drive sleds and the PCI fan. 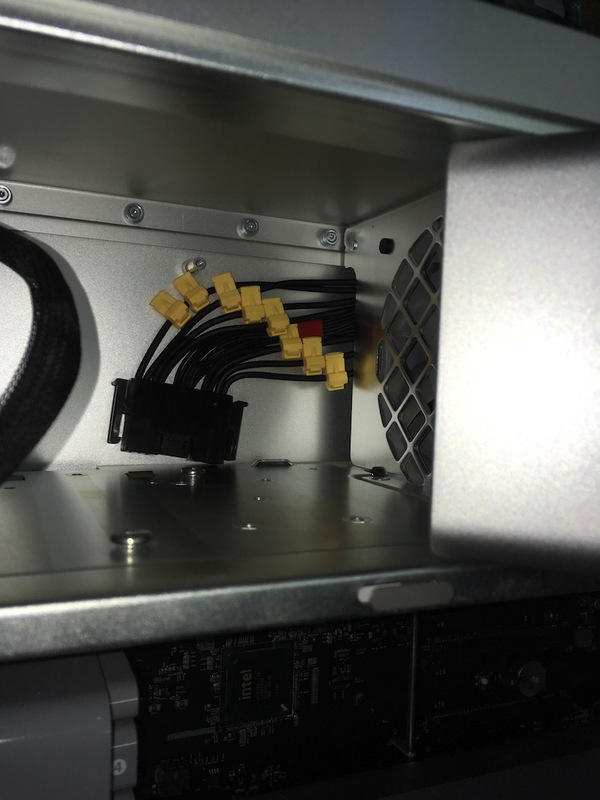 Removing the PCI fan is optional but gives you a bit more space to work with later. Then take out the optical drive bay. 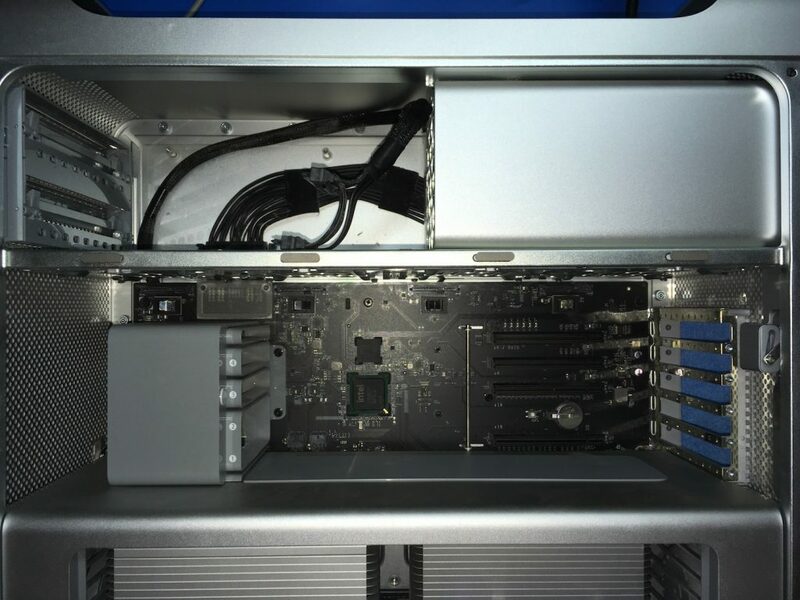 Once the optical drive bay is out, proceed by removing the aluminum back plate. At this point you may want to get rid of the dust bunnies in there and do some cleaning. Next up is the power supply. 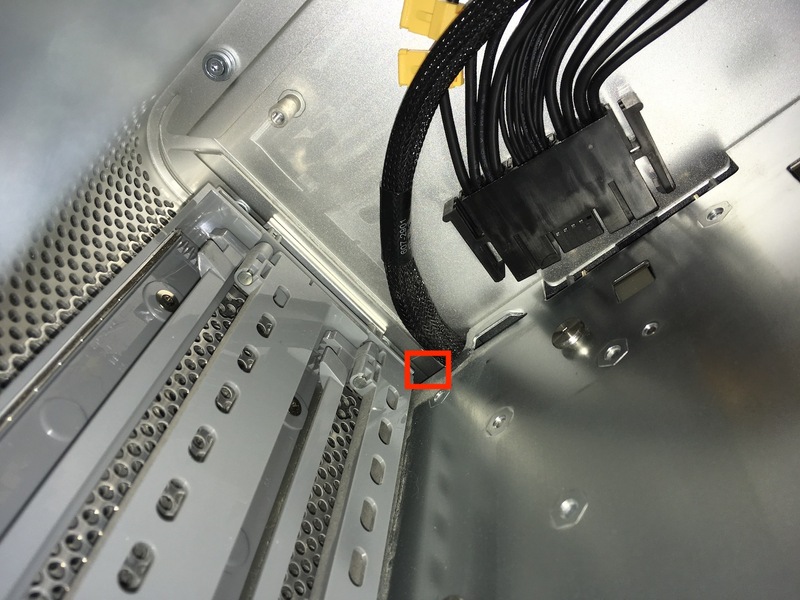 This is held in place by four hex screws above HDD bay 4. This is where the flexible screw driver extension comes in really handy. You don’t want to be clunking around in there trying to get this done with a screwdriver that barely fits, the risk of slipping and damaging the board is just not worth it. 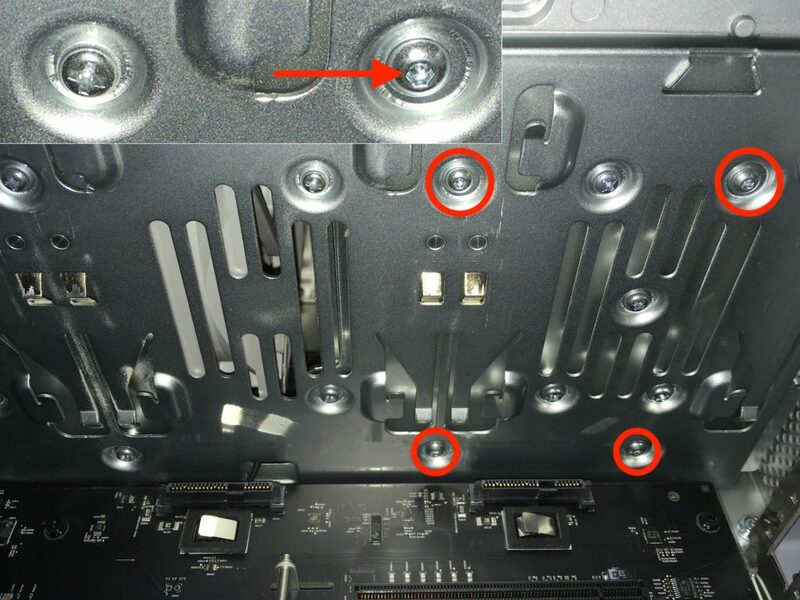 With the 4 screws out, disconnect the power supply from the board. Now slide the power supply to the left slightly so that you can reach in and lift it out of the frame. 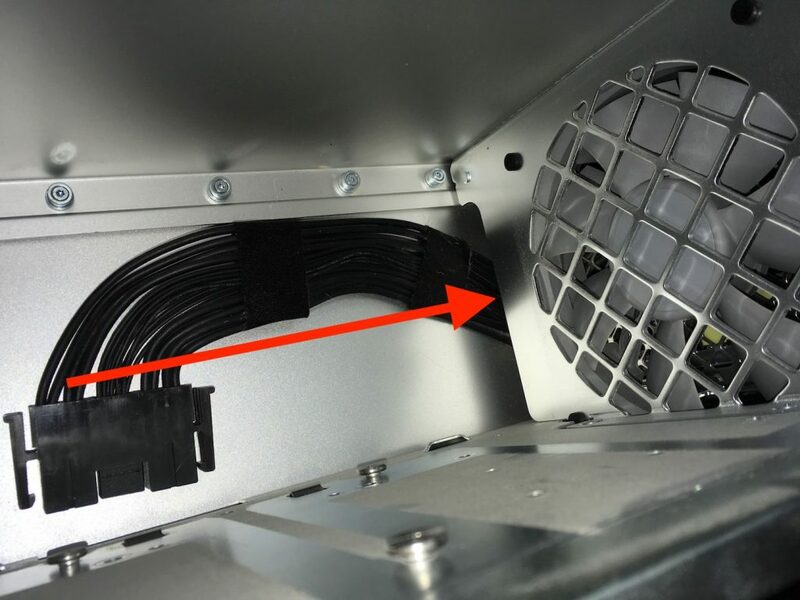 As you lift the power supply, feed the cable through the hole to the other side of the fan. This is the fun part! But before you can start snapping on the taps, some preparations need to be made. The strip of tape has to come off. You’ll notice plastic tabs on both sides of the cable that Apple used to keep the cable nice and flat, these have to come off as well. 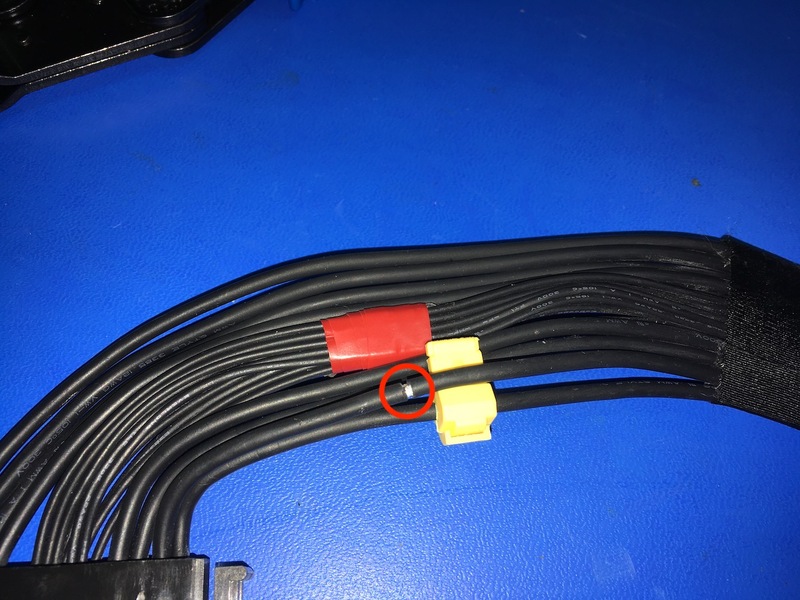 There is a 3rd plastic tab, hidden between the smaller cables, I prefer to leave that one in place. 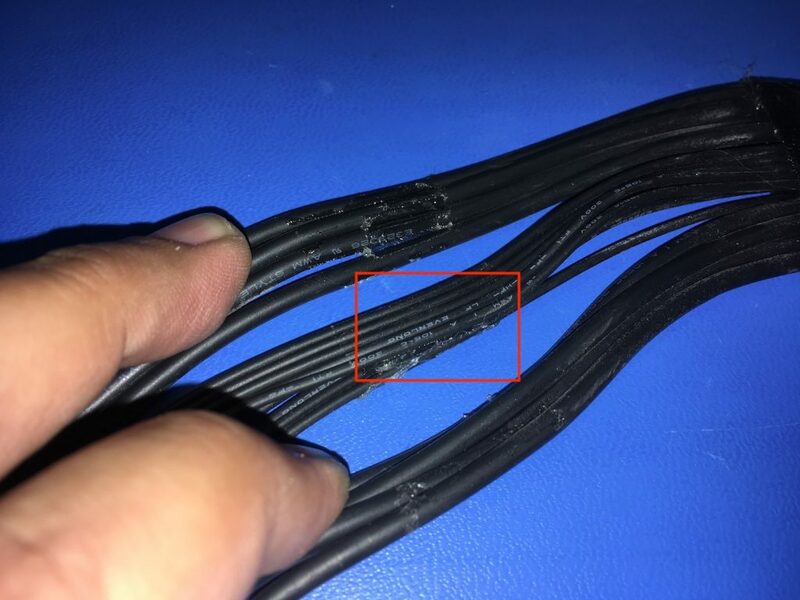 These smaller cables are not fragile but I see no reason to have them loose and potentially pinched once everything is reassembled. So I leave the plastic tab in there and tape it off with some standard electrical tape. Now the worst part about this mod, cleaning the sticky tape residue off the cables. 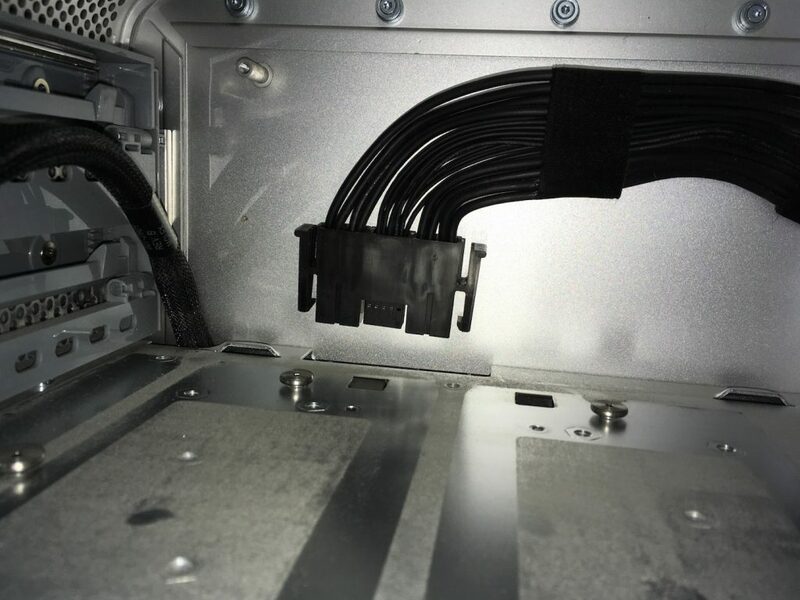 I find that just scraping it off with some tweezers gets the job done and leaves you with 90% clean cables. This is pretty time consuming though so your approach depends on how impatient you are. With the gunk removed, a quick wipe down with a paper towel with some WD40 on it has them at a level I am happy with. If you decide to take the same approach make sure no WD40 enters the connector and dry off all traces with paper towels thoroughly. The tape serves a dual purpose. First it will keep the smaller cables in place and second it marks the cutoff height for the taps. Ideally you want all the taps in the green area. This was my first Pixlas mod and the taps ended up covering one of the screw posts for the ODD back plate. Took a lot of work to get it all to fit. Thanks to this experience I now stay in the green area I show in the previous image. When you see the end result you can compare and clearly see why it’s a better option. 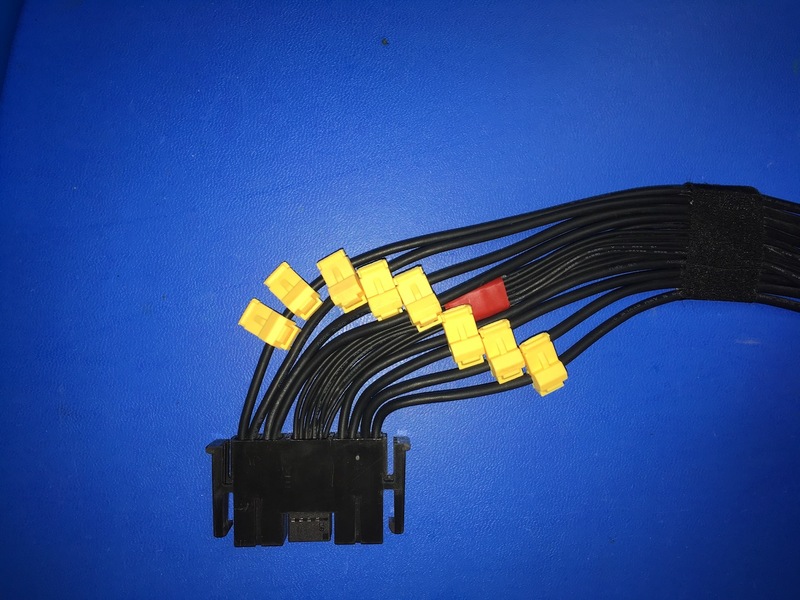 The PCI cable I used and linked to at the top of this article will have 8 wires. The power supply has 4 x 12V and 4 x Ground, so one of the ground wires will end up with two taps on it and one 12V wire will be unused. 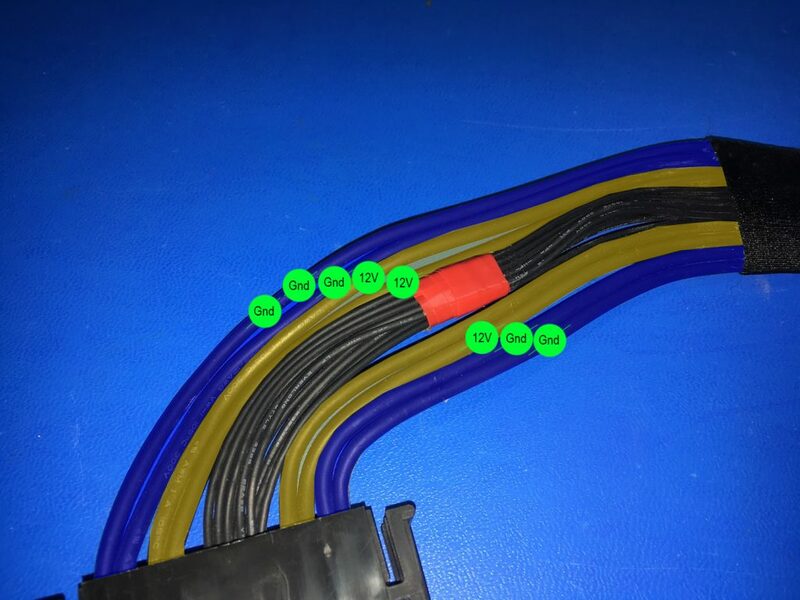 The two thick outer cables on both sides (marked in blue) are Ground. 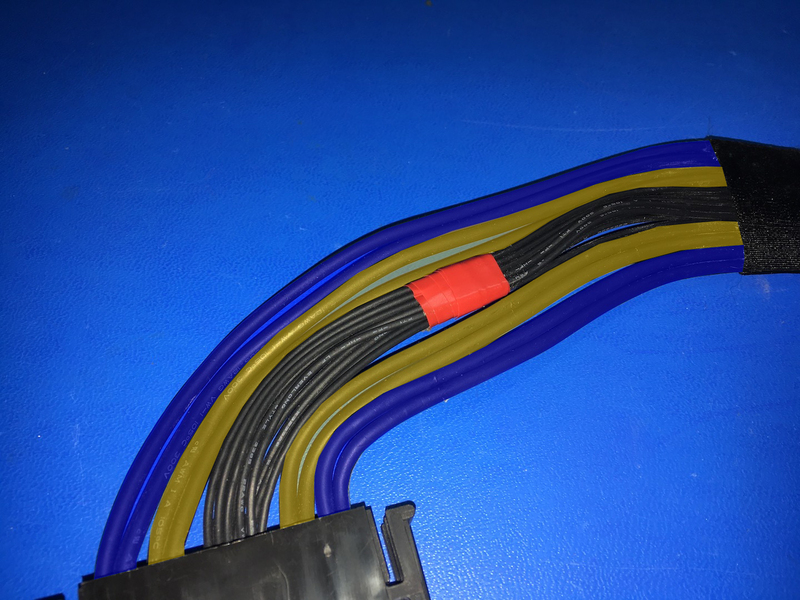 The two thick inner cables on both sides (marked in yellow) are 12V. 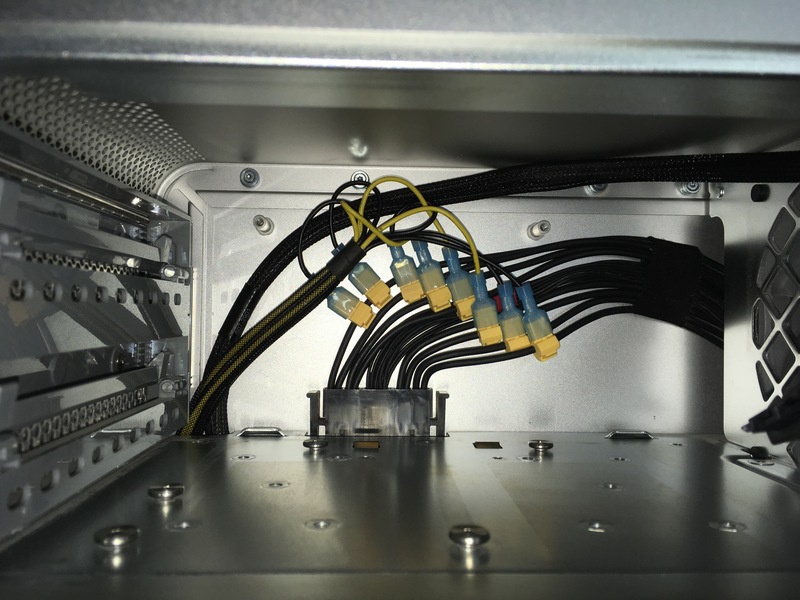 These are the cable options for the 1,1 – 3,1 Mac Pro’s. Thank you to Mika Kilpinen on Facebook for the photo! 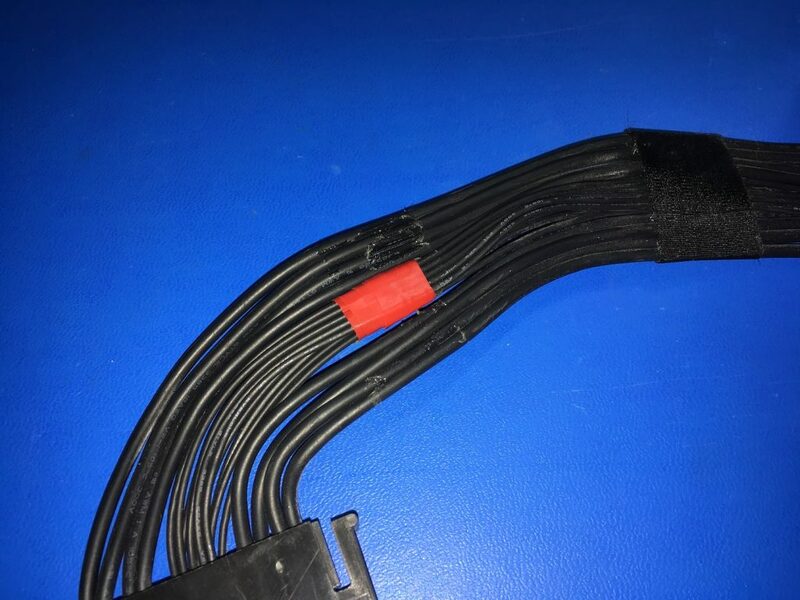 This is where the multimeter comes in as I have not personally tested these cables unlike the ones in this post for the 4,1 – 5,1 Mac Pro. 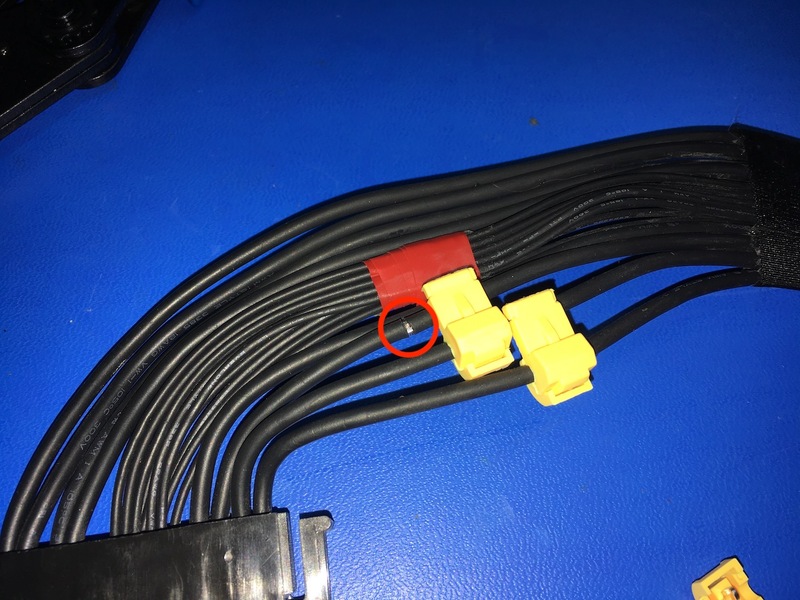 According to information I have found the marked cables are the correct ones for 12V and Ground but double check with a multimeter to be sure. Cables marked in blue are Ground. 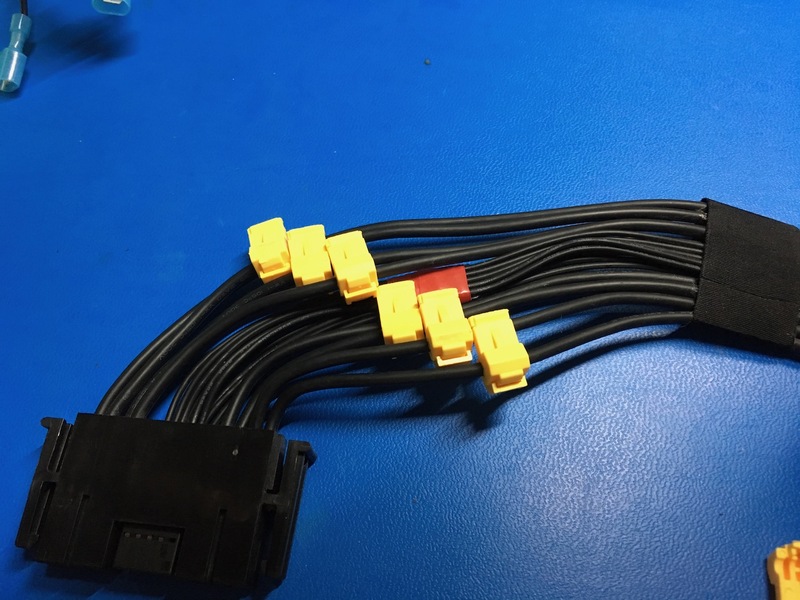 Cables marked in yellow are 12V. Please pay close attention to the cables marked with a warning symbol. 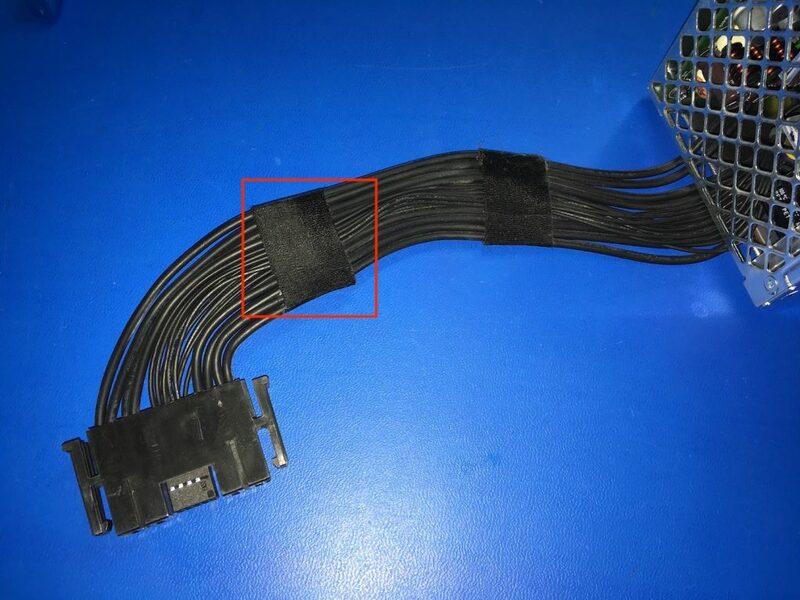 In these locations the cables are not identical on both rows of the connector, so make sure you select the correct one. 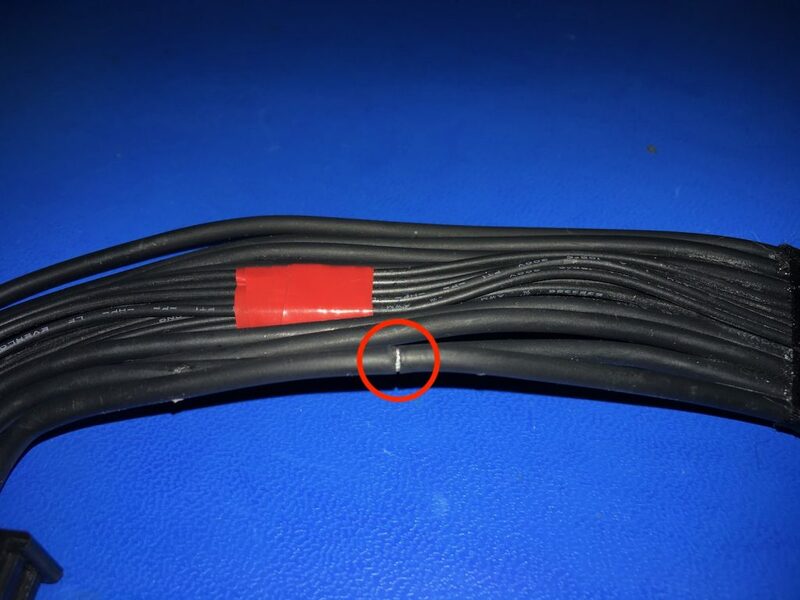 To err on the side of caution, use the P1/P2 (or J1/J2) cables as those are mirrored so the chance of tapping into the wrong cable is much smaller. 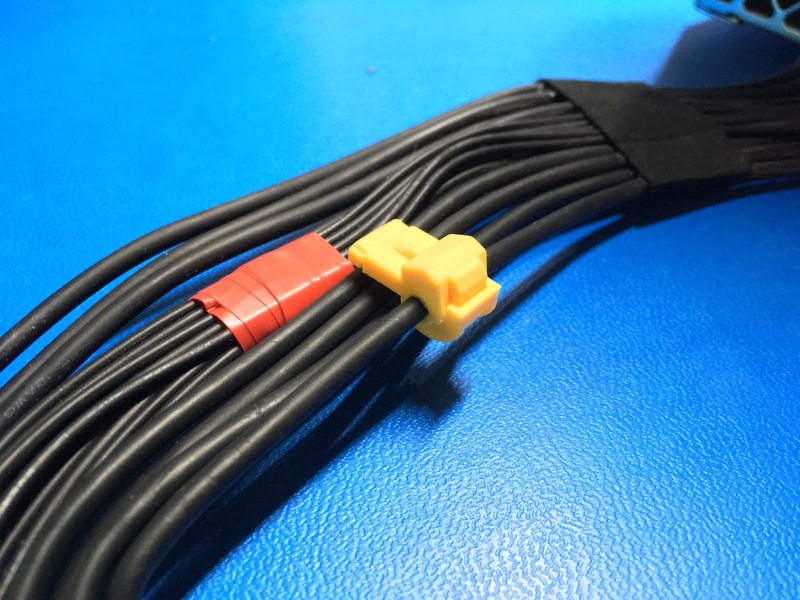 Use the P3(J3) and C cables if you’re feeling adventurous. 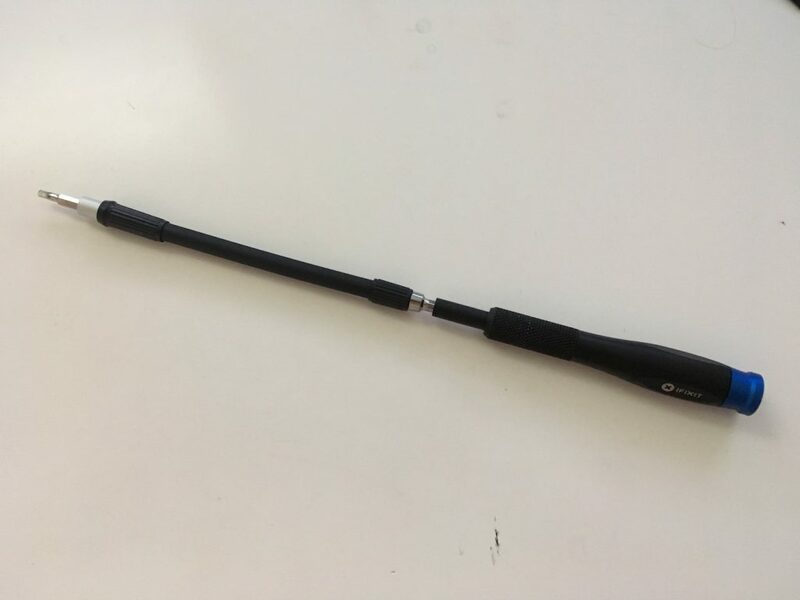 Now the cable is wrapped in a pretty sturdy black insulation. The taps (and you) will have a lot of trouble getting through it if you put them on directly. I cut the insulation all around and pull the material aside 2mm, just enough for the tap to fit in there. Place the tap and lay the cable in place. Make sure the tap points the right way (up) and then clamp that sucker into place. This can not be done with bare hands, you’ll need pliers or anything that lets you put the amount of force needed. If it pops open after the first attempt, just close the tap and try again. If it does pop open, at least it’ll give you a chance to inspect and make sure the cable got in there nice and tight. Take your time, no need to rush through it. Once the tap is closed properly you’ll know. Then move on to the next cable. You get the idea 🙂 Try not to have any of the taps overlap, you want them side by side so everything can lay nice and flat when you reassemble. The last cable will require two taps. The power supply is ready! 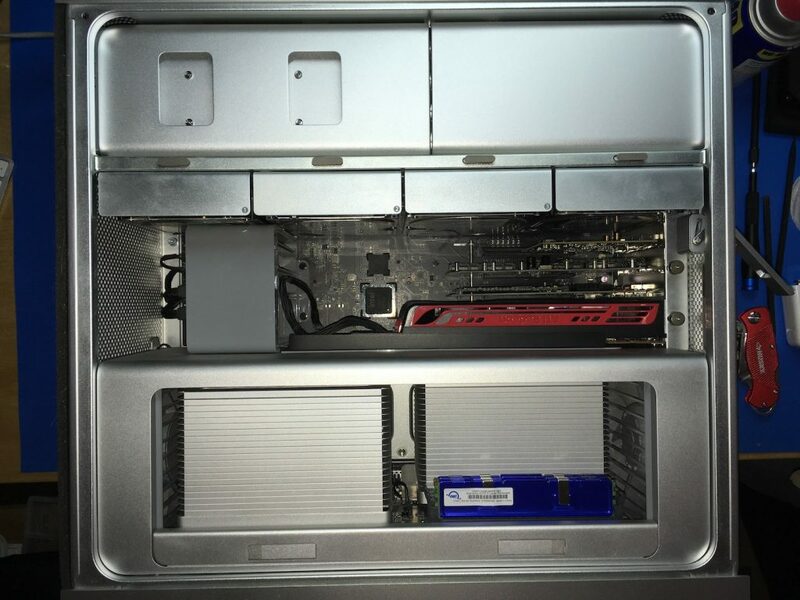 Give all taps a final check, try to open them with your hands (if they pop open, it wasn’t closed properly) and if everything is solid, put the power supply back in the Mac. 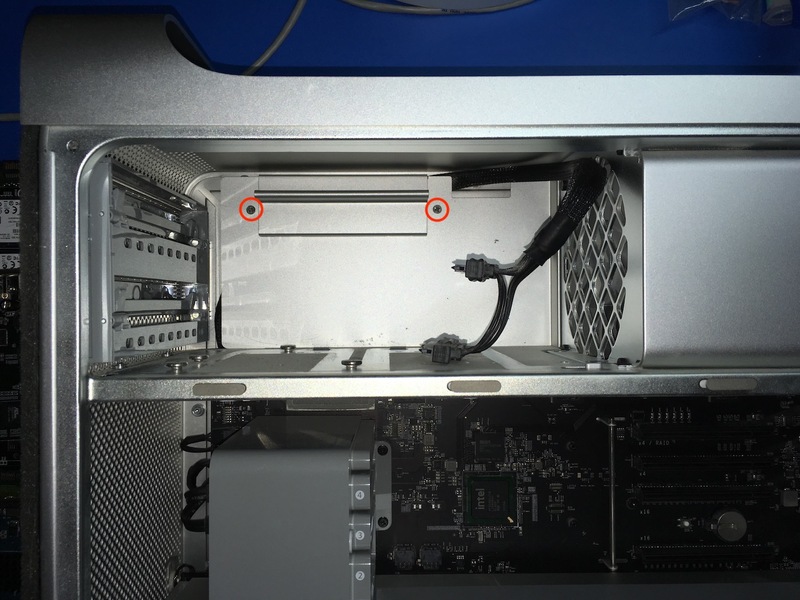 Guide the cable underneath the fan as you lower the power supply back into place. 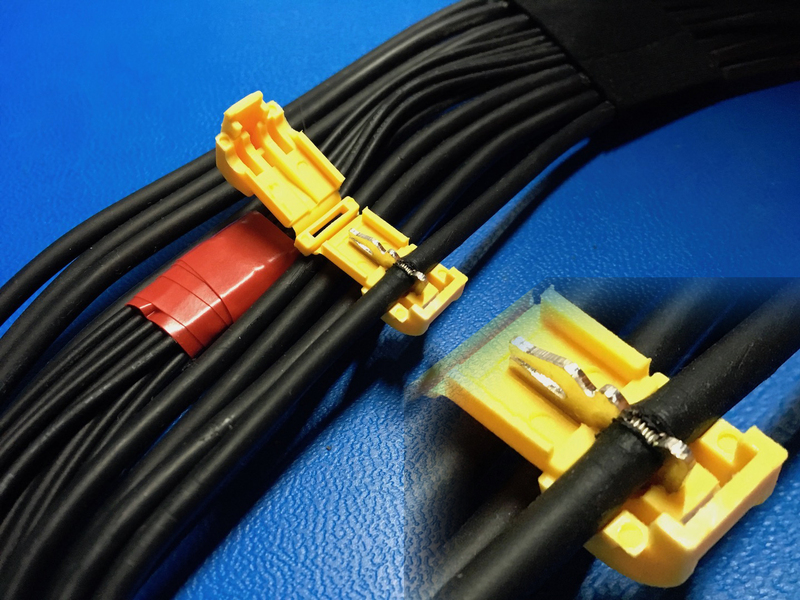 If you feel too much resistance or the cable simply won’t go through, take it slow and take your time. If all the taps lay side by side, the cable should be flat enough to fit through the slot quite easily. 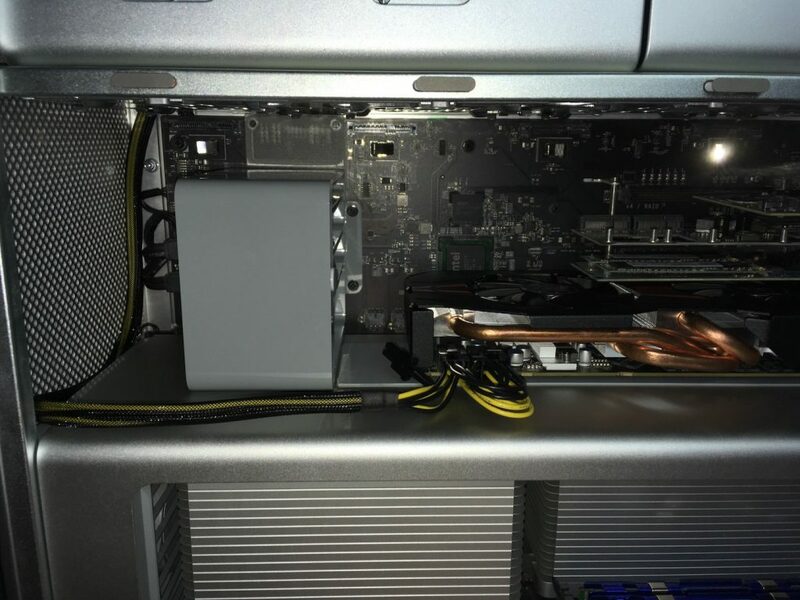 Once it sits in place, screw the power supply back into place. Don’t connect the power supply back to the board just yet. First you need to get the PCI cable in place. 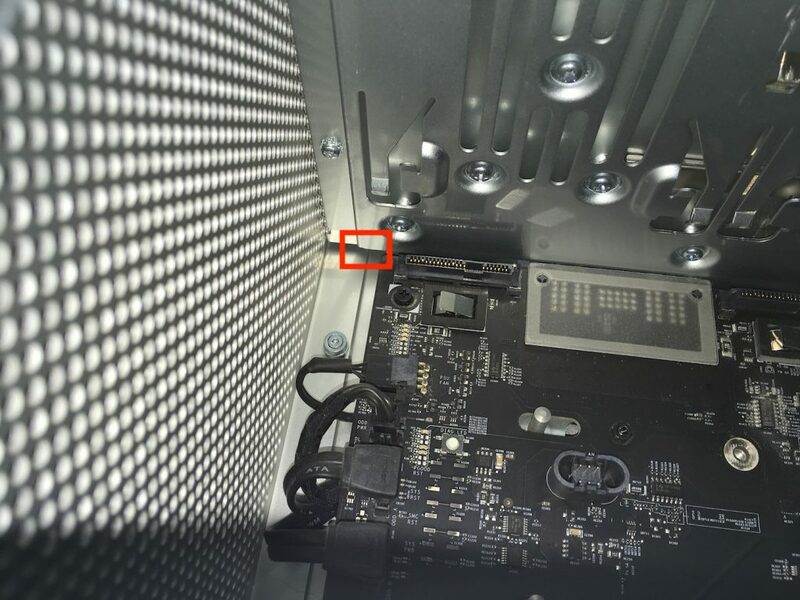 This is done by feeding it through a small space right next to the optical drive SATA cable. Feed it in from the botom. 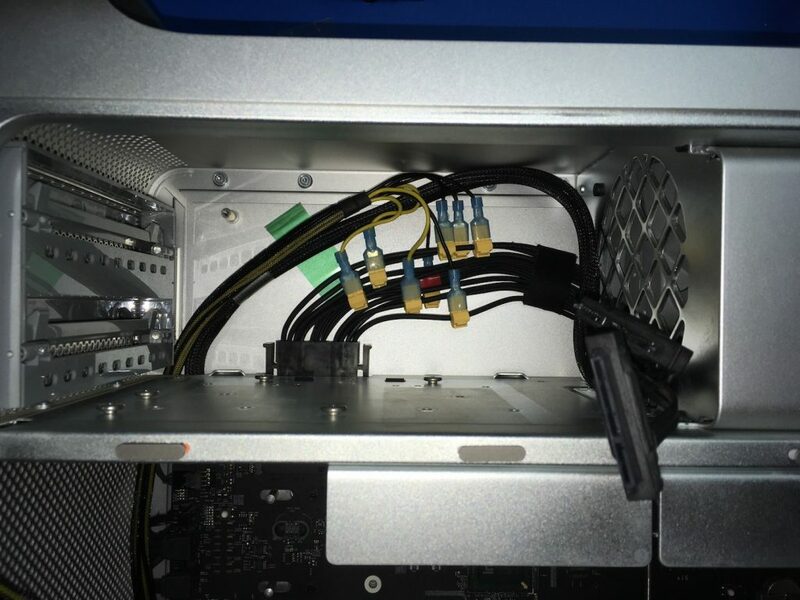 To make this easier, put some tape over the PCI cable so you’re not dealing with 8 individual wires. Then feed it out the top. This will ensure a snug fit into the spade connector. 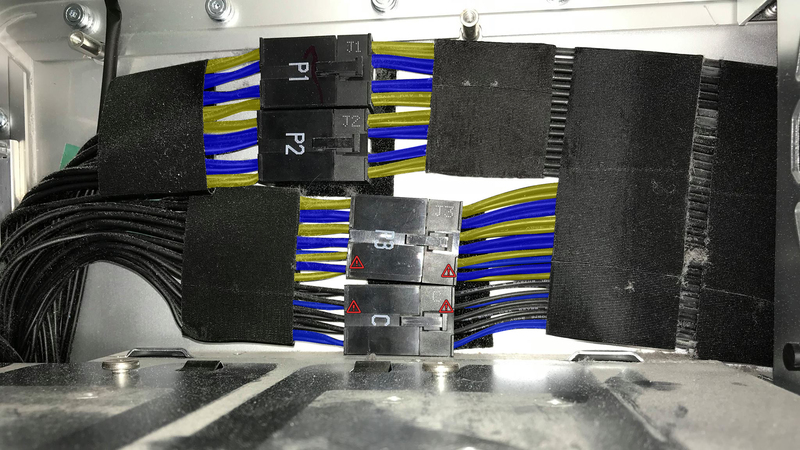 Put the spade connectors on all the cables and use a crimper to make sure it’s permanently on there. 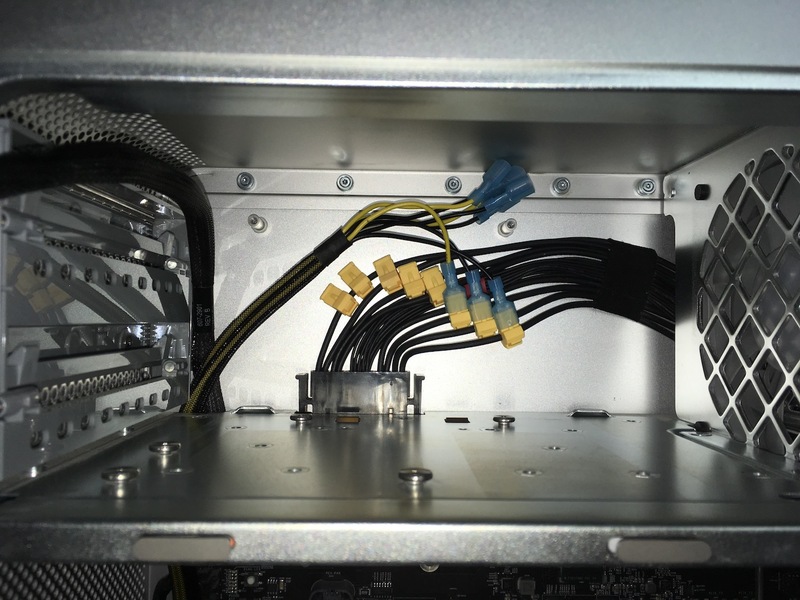 Once all the connectors are in place, pull the cable down to give yourself space to work and hang the optical drive cable to the side for now. Time to start connecting! 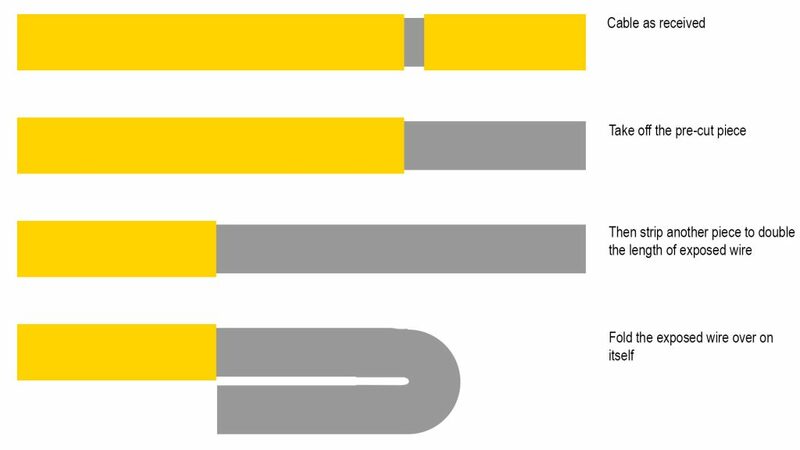 Use the diagram above to see which cable goes where. 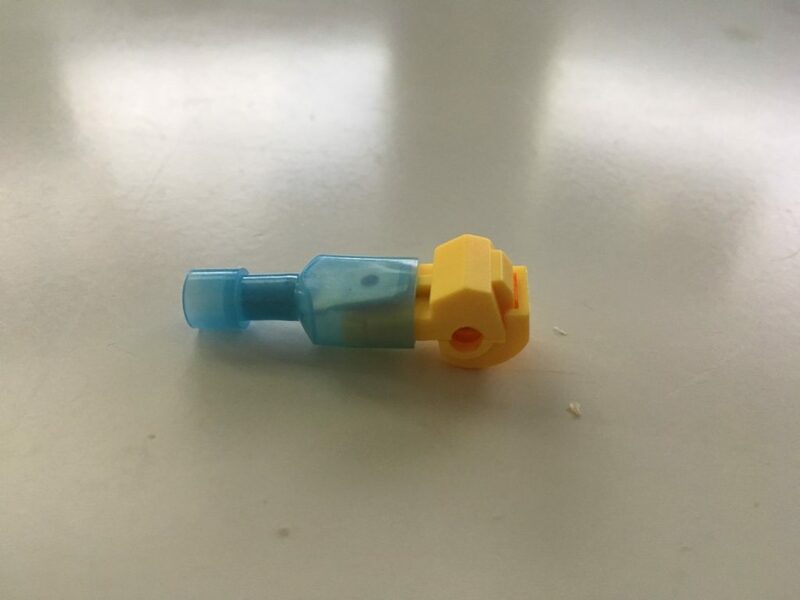 Take your time and make sure the connectors snap into the tap firmly. 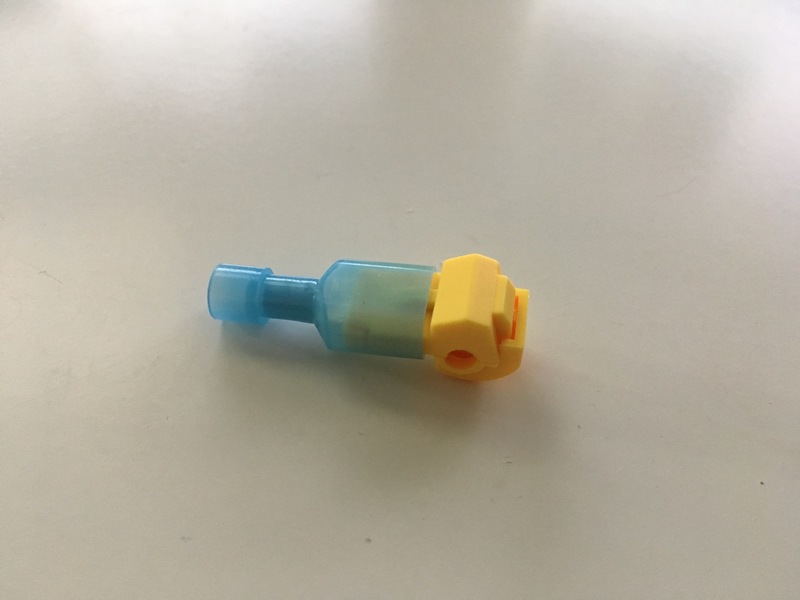 The spade connectors may fold to one side rather than clip into the tap, check both sides of the tap to make sure the spade went IN to the tap and not off to the side. Route the cables so that they are loose. Loop it around, weave it through, whatever gives you a smooth connection. If cables are tight, find another path to connect it. The result should look something like this. 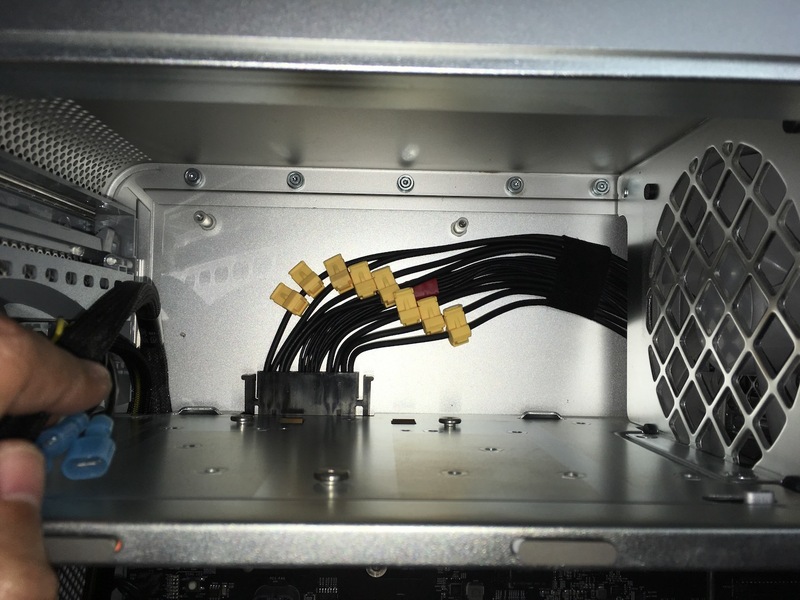 Both screw posts for the back plate unobstructed, all taps side by side and the optical drive SATA cable routed along the top. Now see if the back plate fits. Don’t force it into place, it will bend and the cables behind it will have a lot of pressure on them. Take the plate out and rearrange cables as needed to make it fit comfortably. If in the end it just won’t fit… leave the plate out, you don’t really need it anyway. 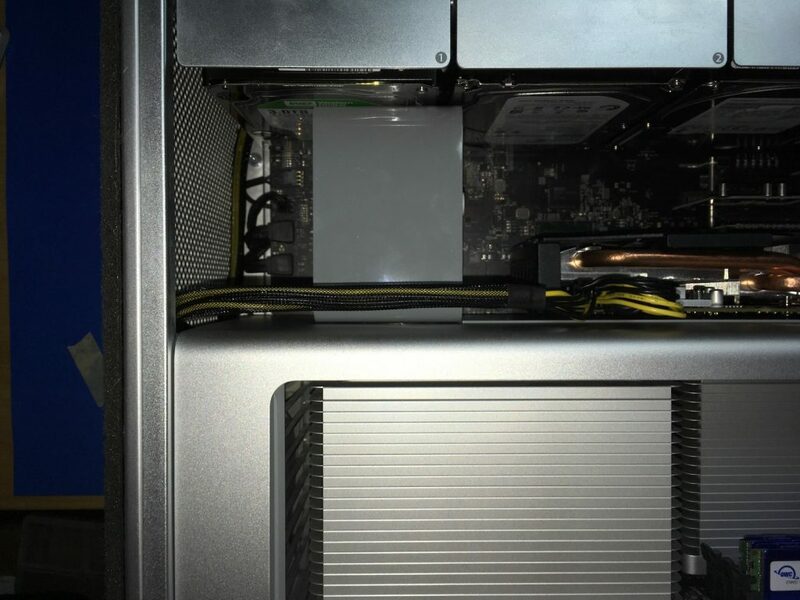 You should have plenty of cable left to route it along the edge of the board, across the intake fan and to the GPU. 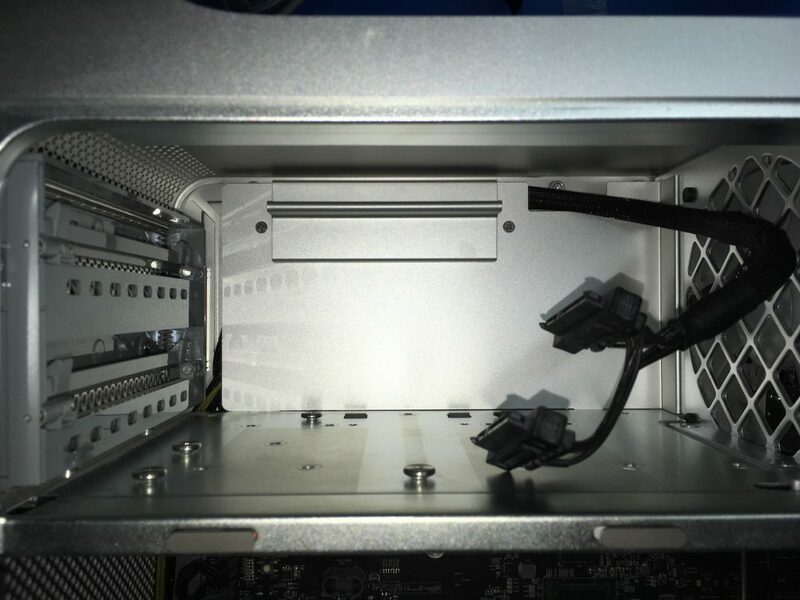 If you’re happy with the result, put the optical drives bay back and start reassembling your Mac Pro. 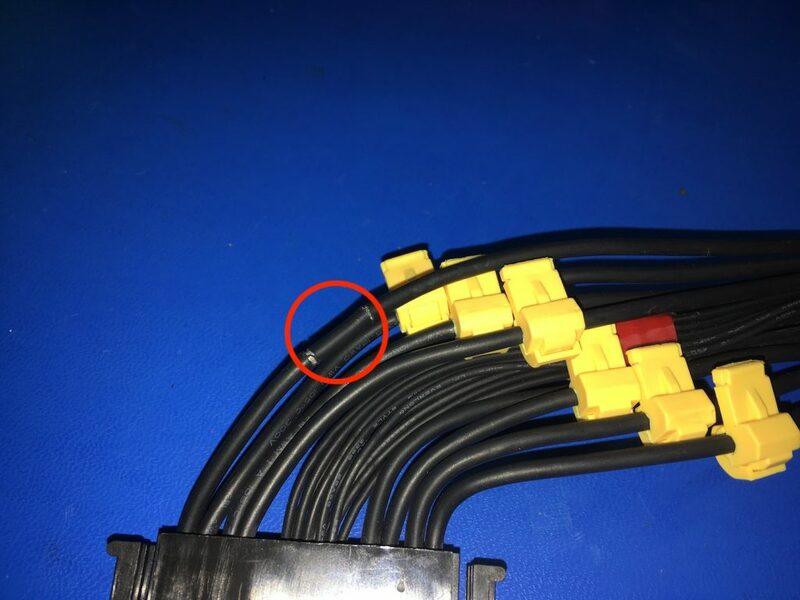 Q: Why did you not cover testing the cable with a multimeter? A: Because the power supply cables were stripped before placing the tap, I am confident in a solid metal-to-metal connection. Measuring output with a multimeter is just to make sure power is flowing through and the tap was not obstructed by cable insulation. I do recommend using a multimeter if you’re doing the Pixlas Mod on a 1,1 – 3,1 Power Supply to verify my image did indeed mark the correct cables. Q: What are other ways to get this mod done? 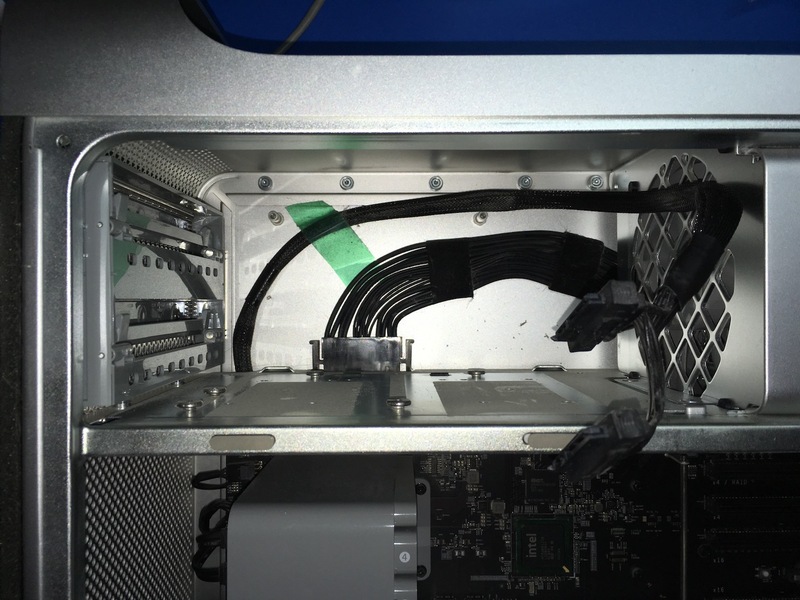 A: Instead of using taps, you could take apart the power supply and solder the PCI wires directly into it. 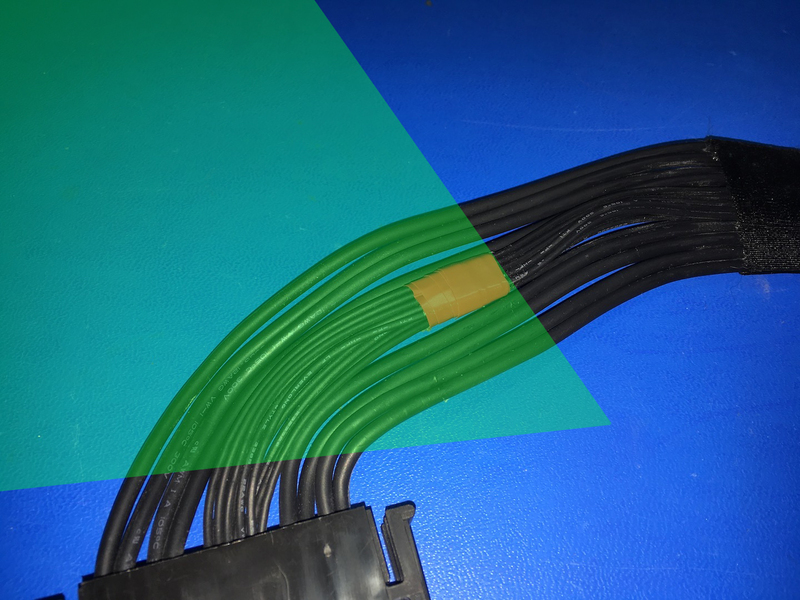 Apart from being a fun project, I do not see clear benefits using that method and the PCI cable I linked to here will be too short so another solution will have to be found/created. This was put together pretty quickly, I might add more information to this page in the future. All relevant information is already here though. 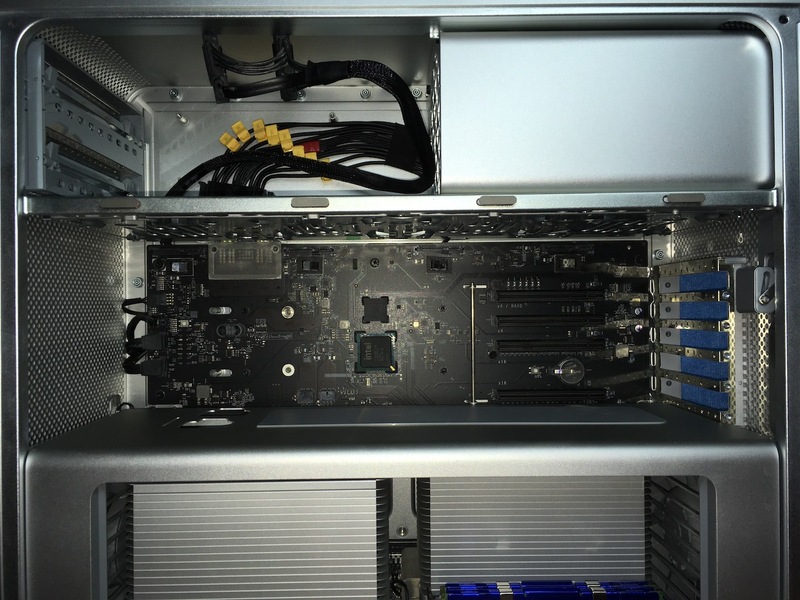 May 23, 2018 – Added image with 12V and Ground color coded cables for the Mac Pro 1,1 – 3,1 power supply. December 24, 2018 – Hrutkay Mods has made a video based loosely on this guide, you can find it here. He intended to follow the guide step by step but had to go in a different direction; soldering instead of splicing. If you want to take the soldering route, do check out the video. March 24, 2019 – I have made a video about the Pixlas Mod as well that follows this guide. You can find it right here. Great post! Very Hard to find this type of information lately. Not sure why. I do have several questions but want to re-read first before asking something really stupid. Appreciate it. 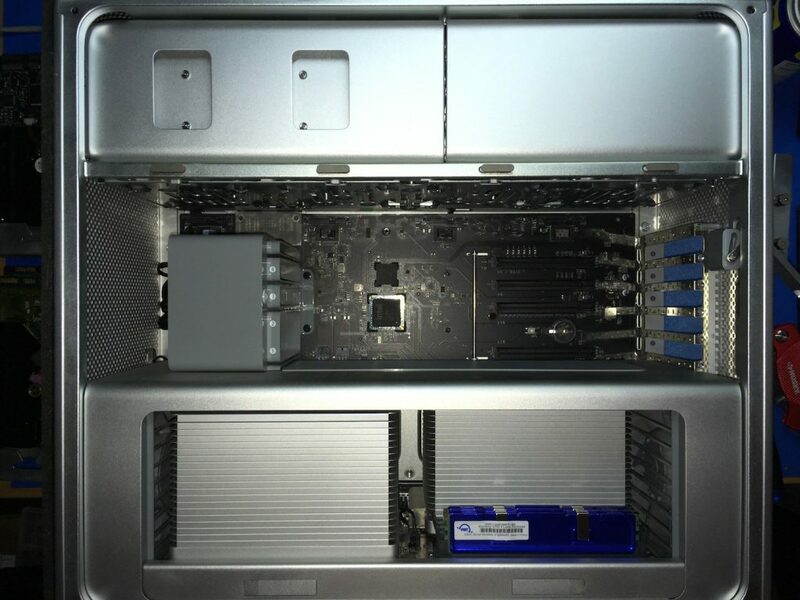 Great Mod, i will try it on my Mac Pro, just a dumb question, is the power output on the resulting 6 pin is 75w? 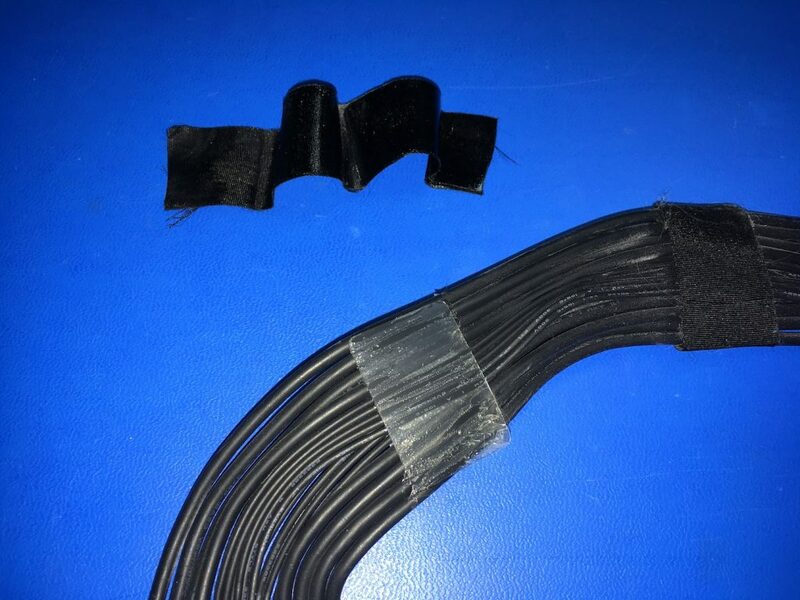 Hey, I notice that the fourth larger wire—on the right side—has no clamp around it. How come that wire is left alone? Thanks for the guide – went like a charm, but I am stuck. All blades are seated, wires were prepped with a gap for the taps, multimeter shows 12.46v at each +, but the dual EVGA NVidia 1080ticards are still not being recognized by the system. This was my first time doing this mod, but I think I got it all. Machine boots up without issue, just doesn’t see the cards as if there wasn’t power at the 8-pin connector.What could I have missed? Thank you for the clear instructions. I modded my cMP now as well. 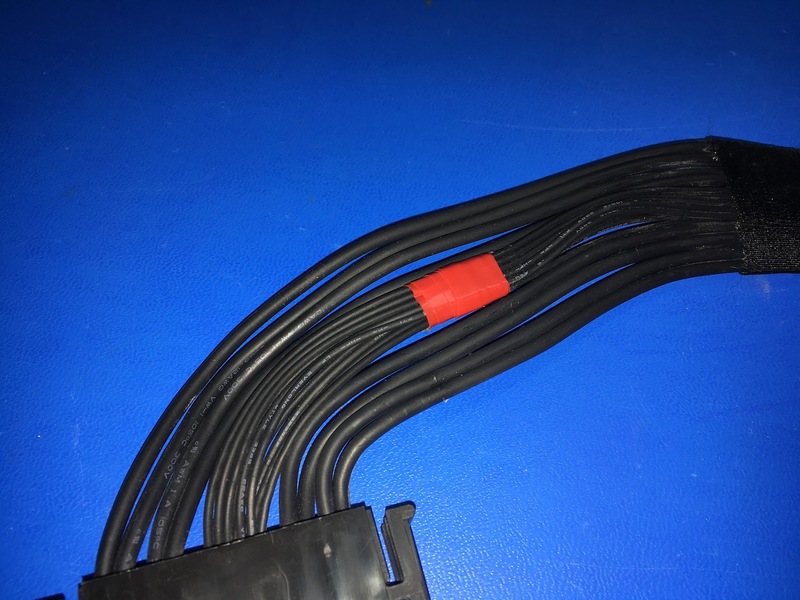 Because of a VEGA 64 I had to take out the front fan assembly and hooked up a standard 12V fan to the now obsolete PCIe 6-pin connectors. It’s too loud, so after Christmas I will be getting a silent one. Hi, great post. Any preference on where to connect each 12v and ground, would it matter if the right side ground have the tree ground cables connected instead of to the left side ground? 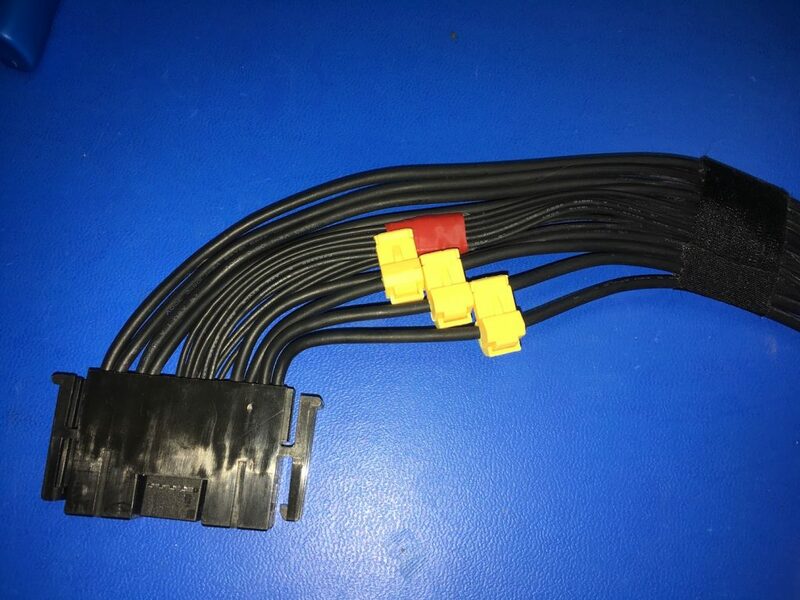 Is it known what right and left side 12v supplies? Maybe one for each CPU?